A Paean to Librarians and a Nod to General Gage. Librarians are cool. They are a part of my personal pantheon of professional problem solvers who, with all respect, dwell along side auto mechanics, stage hands and family doctors. My auto mechanic for the past 30 years can sometimes diagnose a car’s problem simply by listening to it. He never over charges and doesn’t charge at all for minor adjustments or checking things out. Stage hands the world over, guard their territories like pride lions, but can relish opportunities to improvise solutions for unexpected requests. Any touring group worth its jet lag will cotton up to their venue’s stage Meisters. My family doctor brings relief just by entering the room and a librarian behind a reference desk is an invitation to the thrills of exploration and discovery. Hanging out with these pros is always a win win situation. Not too long ago I gave a lift to Kathleen McMorrow, then head librarian of the Universty of Toronto Faculty of Music and her husband John Beckwith, composer and scholar. During the ride, Kathleen and I began discussing her library, one of the very best in North America and her librarians, some of the most knowledgeable and helpful people I’ve had the privilege to know. My opinion of them is based on the abstruse subjects I had asked them to ferret out and their quests which never seemed to fail. “Yes”, Kathleen answered. “We like to be asked difficult questions. The more difficult the better. My first meeting with a librarian did not go well. I was in my second-year of college when a drab PhD student from a large Ivy League university near by, showed me her thesis and asked if I could make manuscript copies of 125 examples of cadential dissonances in the music of Josquin des Prez. [1.] I was broke and she was going to pay. So naturally I accepted the challenge without giving any thought to the amount of time this would take. I was slow in getting the job done and she was frantic. In her mind, the success of her Magnum Opus was threatened by a recalcitrant under-grad. Many years later, in a city far away, I visited a public library seeking pocket scores to orchestral repertoire. There, behind the music desk, was my unhappy PhD candidate. She was still unhappy and seemed embarrassed to meet me again. I didn’t ask about her thesis or where the library kept its pocket scores. No matter, neither of us had anything to say to the other. I found the scores on my own and left. I was a neophyte, a real know nothing, but with patience and words a civilian could understand, I was led into their realm, every step an adventure of discovery. 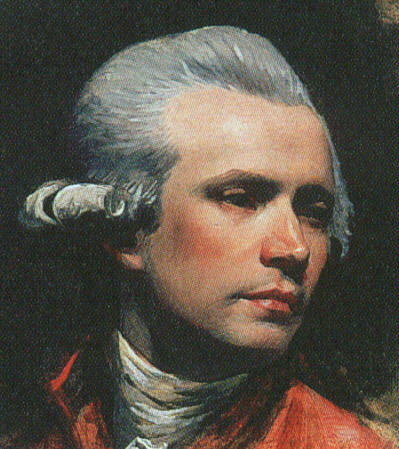 We have received your request for information regarding the portrait by John Singleton Copley. This portrait of Gen. Thomas Gage is not specific to any battle, perhaps Copley thought he was being politically circumspect by representing Gage as a gentleman in the portrait; though he showed the general in a political environment, on a military field , and dressed in full British military regalia, his approach is nonpolemical: he takes no partisan position, neither making references n support of nor alluding to the benefits of British occupation. But the very image of General Gage, even though portrayed neutrally, was politically charged. This painting was done ca. 1768-69 and the Battles of Lexington and Concord didn’t happen until 1775. Copley and Gage met when the commander came to Boston in 1768 on orders from the king to still the unrest caused by British soldiers in the town. Gage was not entirely successful in his efforts and, indeed, met the opposition of patriots such as Samuel Adams. But his presence was appreciated by many colonists, especially members of the Massachusetts elite. 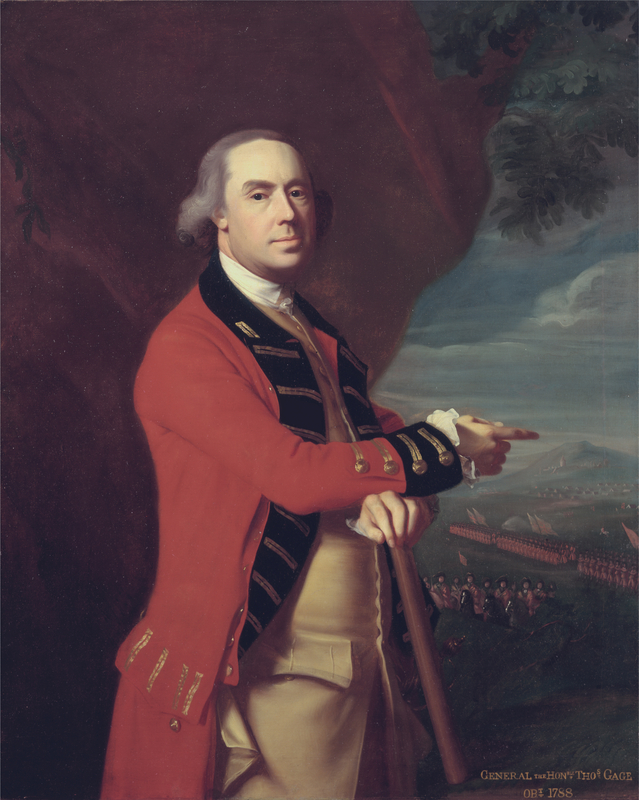 Copley’s portrait betrays no hint of the strife that surrounded his sitter but presents an authoritative picture of a distinguished an affable officer pointing out troops performing orderly drills and equestrian maneuvers. It is an archetypal image of a military man, the composition of which Copley may have derived from any number of similar portraits of British officers that he would have known through mezzotints. American Paintings and Sculpture Dept. This is good stuff. I encourage anyone with a really difficult question to visit your local librarian. You may be surprised by what you learn. 13 May 1774 – 11 October 1775. 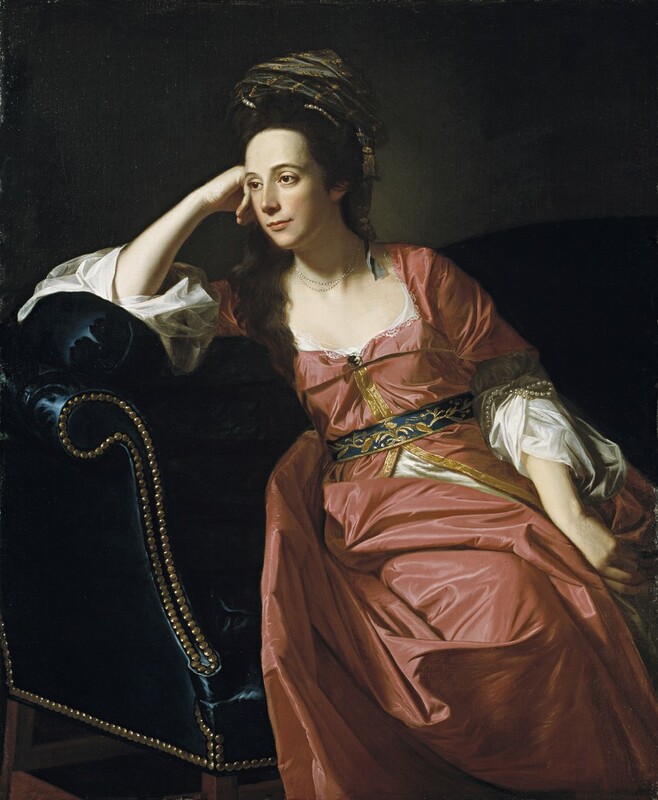 Margaret Kemble Gage (1734-1824) by John Singleton Copley, 1771. Born in New Jersey, Wife of Gen. Thomas Gage commander of British North American forces. During the War for Independence, she was suspected of passing military information to colonists. John SingletonCopley, self portrait, 1784, National Portrait Gallery, London. The Death of Major Peirson, in the Battle of Jersey in 1781, by John Singleton Copley, 1782-84. [2.] See my article Le Carillon National, Ah! ça ira and the Downfall of Paris|,The opening credits give an idea of the services librarians provide for their patrons. [3.] Copley (1738-1815) was self taught. I am amazed by this fact when I view his skill with fabric in Margaret Kemble Gage’s portrait and his handling of the complexities of a military mêlee in his Battle of Jersey painting. He was extremely successful and moved to England during the War for Independence. 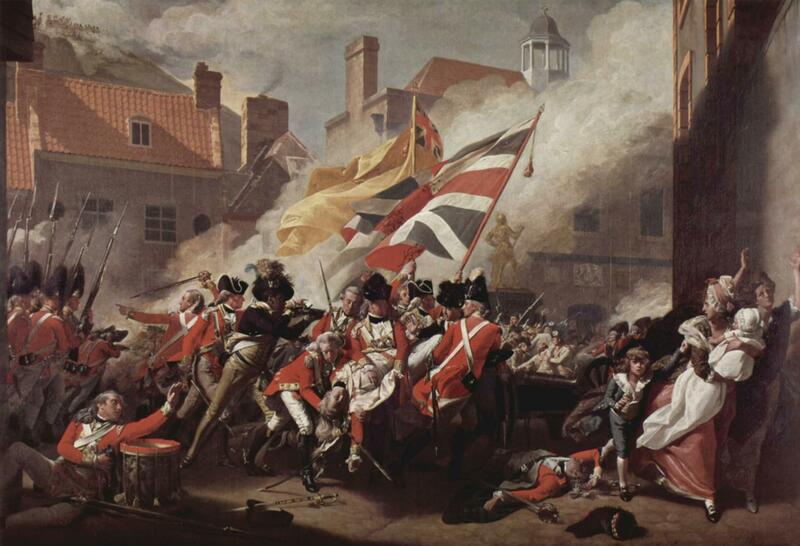 The painting above, titled The Death of Major Peirson, in the Battle of Jersey, 1781, painted between 1782 – 84, made copley famous in Britain. It is yet another military Death of painting with the ubiquitous drum, shown here supporting an arm of a wounded combatant.